A non running event report? What sort of blog is this? 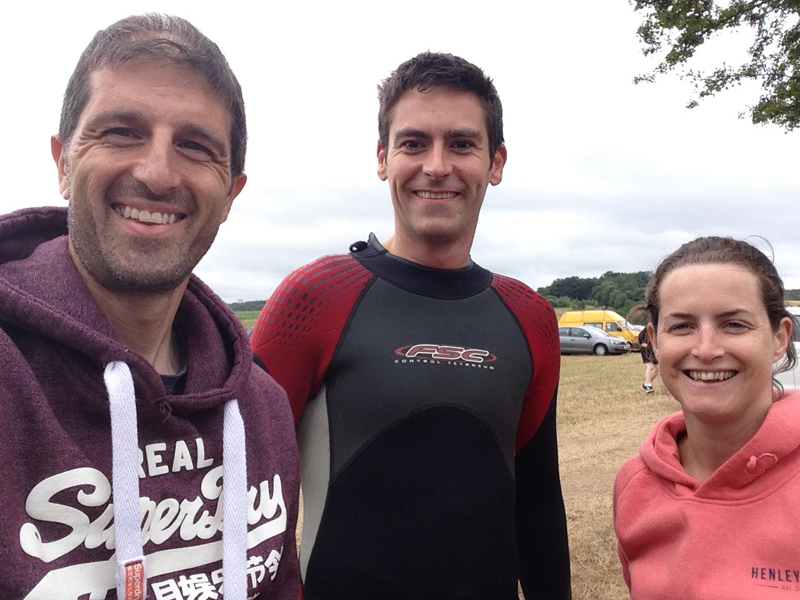 Well I did something a bit different last weekend and took part in my first ever open water swimming event. It all came about thanks to my work colleague Katie, who had been contemplating doing the Henley Mile Swim last year but (despite several prompts from me) never got round to signing up for it and a deal was struck this year that if she signed up then I would take part in the event aswell. Katie was aiming to raise funds for First Days Childrens Charity as part of this event. My standard of swimming at the start was about a few lengths of the pool but I thought a single mile was doable and it was a good excuse to go swimming once a week and use the swimming as some form of upper body/core strength exercise with a challenge on the end of it so there was some end goal. My build up and routine was fairly simple from January, I started going swimming once a week in the pool and swam as many lengths as I could in a lunch hour. Katie and I settled into a routine with Katie visiting the fast lanes and smashing out her lengths front crawl and I would go into the slow lane and gently breast stroke a few lengths. I find swimming very tiring (particularly when not trained) and usually feel famished at the end of swim. My upper limbs ached after the sessions but I gradually got used to doing more and more lengths. I found breast stroke pretty comfortable and perhaps a little lazily settled into a comfort zone. 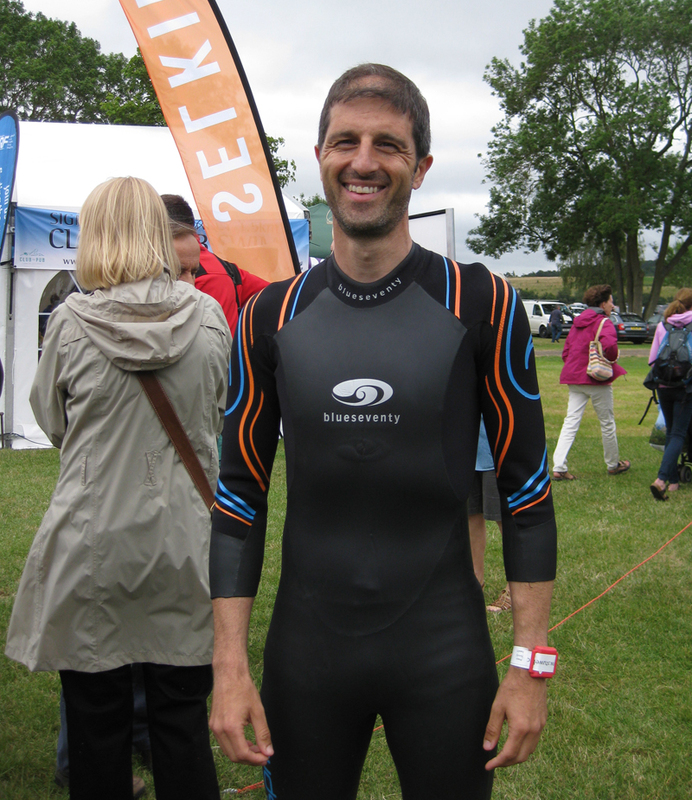 I also picked up a second hand wet suit (thanks Frank) so I was all kitted out for the event itself. 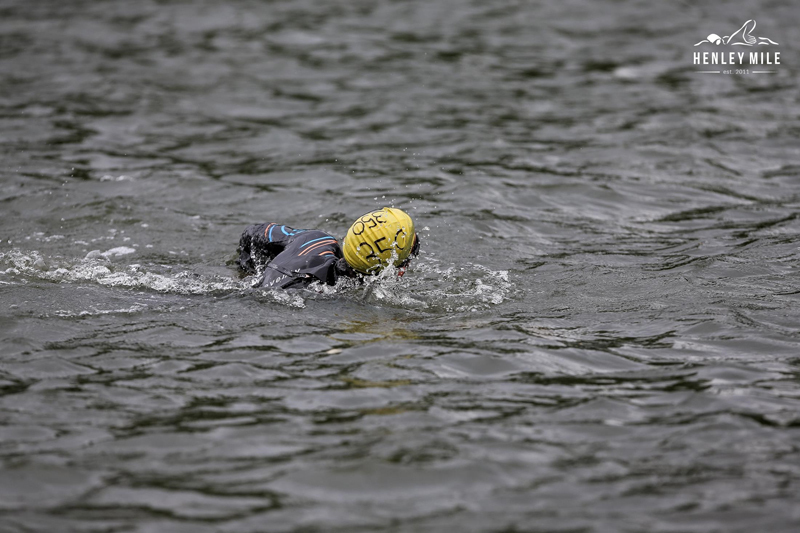 About three weeks before the event, we decided that we had better do an open water swimming induction session having never been in a river or lake in a wetsuit and this took place at the Tri20 centre in Reading. Within a couple of hours I had at least got in and out of my suit, attempted to learn the art of ‘sighting’and even tried a bit of front crawl (but couldn’t really get into a good rhythm with the breating/sighting and strokes if I’m honest). I was surprised by the buoyancy of the wet suits and the fact that it wasn’t as cold as expected and I actually quite enjoyed the taster session. 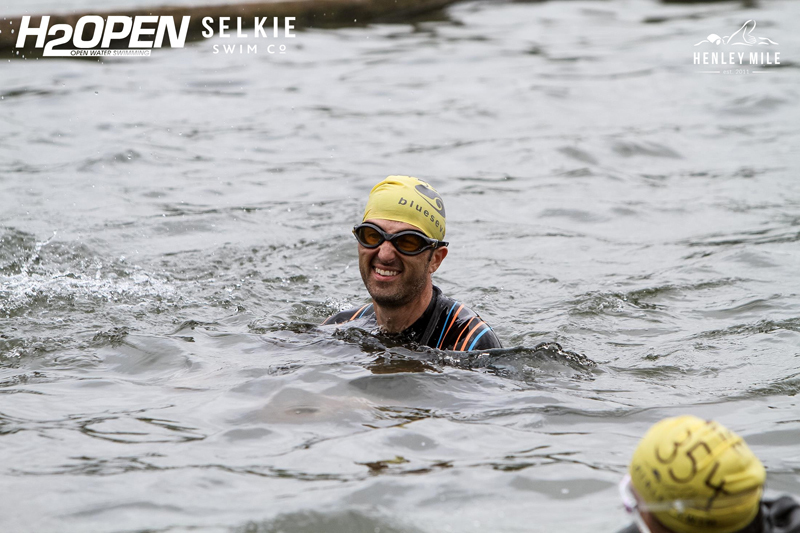 The next week, I returned to the Tri20 centre and completed a couple of laps of the lake (about 750m each so just under a mile) and felt confident that I could do the event on the day. In fact, I didn’t doubt I could swim the distance it was just going to be a bit slow with my pool sessions of 50 mins resulting in 50-55 x 25m lengths (so around 1250m – 1375m). And then the day sort of crept up on us. I’ve started to raise my running mileage as build up to Spartathlon and didn’t want to miss a running session so ended up doing a 20 mile run the day before the event and a 12 mile run a few hours before. I reasoned my arms were going to be worked more during the swim and my legs could get dragged along. We arrived a couple of hours before the swim, registered and took a look around Race HQ. 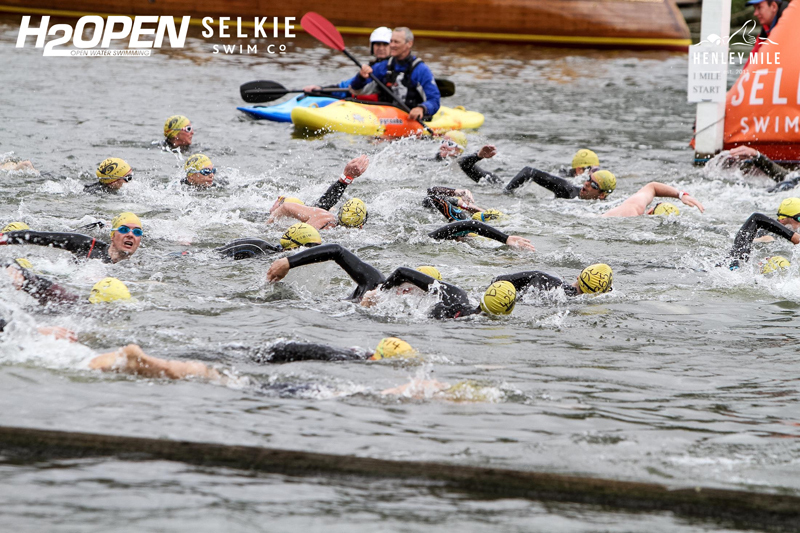 The event was mid-sized with a few hundred people taking part in a number of waves during the day from the Elite/Faster Swimmers first thing in the morning to the more casual swimmers/families (i.e. me). 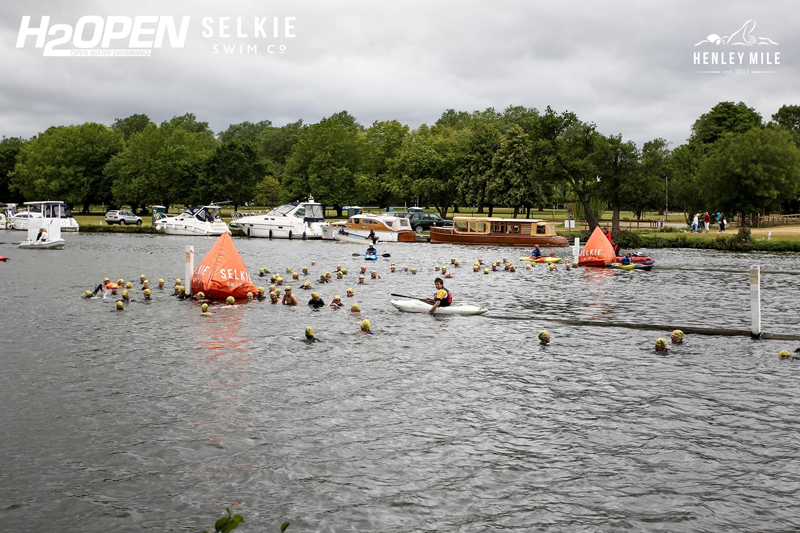 The whole event looked pretty well organised with a race briefing 45 minutes before, followed by swimmers being escorted up river to the start point before swimming back down the river to the finish. The event was chip timed with a timing device on a barrier you swam underneath at the end to record your time. The event was overcast but not the temperature was fine and not too cool although rain was forecast later in the day. There was a lot of activity around the start with friends and families out supporting the swimmers, BBQ, coffee van, space for the kids to run around (and events for them to get involved in) etc so it makes a good few hours out for the family. Another work colleague Paul Davison had also elected to join us. Paul mentioned he had done some swimming in the past but was out of practice at the moment and so he joined us in the sporting category. We were also swimming downstream which would help. The current didn’t look particularly strong but it would definitely help move everyone along. As our briefing time approached we got kitted up and went down to the event briefing and then made our way to the start. We had a short swim to the start point and then waited for our time to go. There was an amusing moment when the race starter asked all the stronger swimmers to go to the front and steadier swimmers to the back and the entire group moved back but as the event started it was clear there was a mix of abilities and I suspect some of the front swimmers in our group could easily have entered the open categories (so either didn’t fancy the earlier start or wanted to look good with the rookies!). I started right at the back and had to wait 30 secs to a minute for a couple of people to clear ahead of me before I could get going. My plan had been to try and do a bit of breaststroke and a bit of front crawl. My front crawl technique is pretty average (i.e. not great and largely untried), my main issue is getting into a rhythm with the breathing, strokes and sighting and my arms always feel tired. On the other hand, I feel as if I can breaststroke all day and you can see ahead of you more easily. I started off with a few minutes of breast stroke to settle into it as the field split into two groups, those who did front crawl went ahead and those (like me) who were breast stroking formed a second group. Ahead of me in the distance I could make out a distinctive building which was about 100-200m from the finish and I just focussed on this. With no watch to tell the time or distance, a straight line ahead and a building which never seemed to get any closer I lost all sense of time. I had no idea how long I had been swimming for to be honest. After a bit of breaststroke, I then tried to settle into a 40 strokes of front crawl followed by 40 strokes of breaststroke and I… sort of did this but did lose count a few times. A couple of friends of mine Frank and Annette kindly came out to watch and Frank spotted me and we had a bit of a brief chat as I swam on along. Again with no sense of time, I carried on. I had overtaken a few people now so was probably closer to the front of the breast stroke group but behind the front crawlers. At some stage I caught sight of the finish barrier. There was no final sprint or kick just maintenance of the same pace although my finish was a little loose as I started to feel a bit tired towards the end and also I kept looking up so I wouldn’t miss the barrier to find I was always a few yards away. 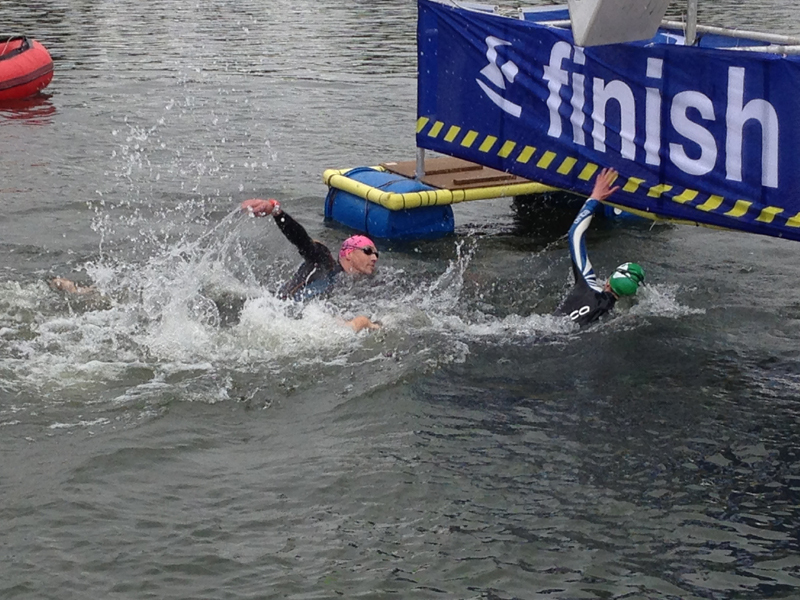 I managed to complete the swim got out to see Paul (who had finished in 27 mins) and Katie (who had finished in 30 mins). 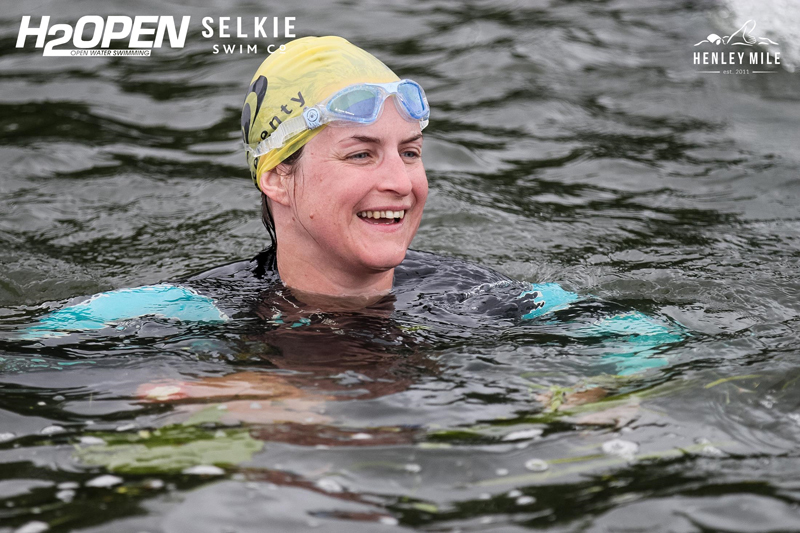 I managed to complete the swim in 35 mins so was pretty pleased with that based on my current level of training and experience and quite enjoyed the event. How to finish properly (not me). 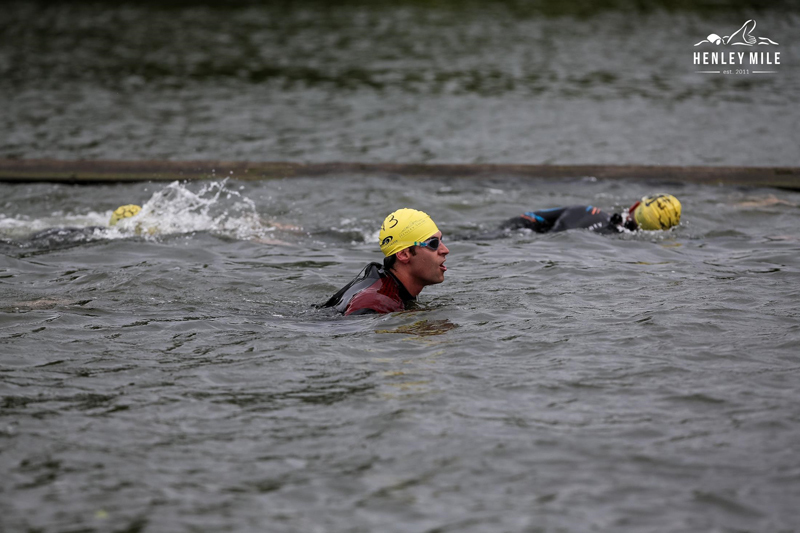 I will probably keep the swimming going once a week and would be tempted to repeat the event again next year. I think the mile distance is good because its achievable based on a limited amount of time in the pool and the swimming could supplement my running and ensure I work all areas of the body. There’s also lots of room for improvement and perhaps next year I should see if I can front crawl the whole distance and better my benchmark time. I would probably be tempted to switch the pool session occasionally for an open water swim where there’s a bit more freedom during the warmer months aswell. The event was really well organised and not at all intimidating for beginners. The cost was equivalent to a big city marathon event (but a lot quicker time wise) however the value for me has been the few months build up, exercising, supporting Katie on her Charity effort (she raised nearly £2k for her charity which was fantastic) and trying something a bit different. 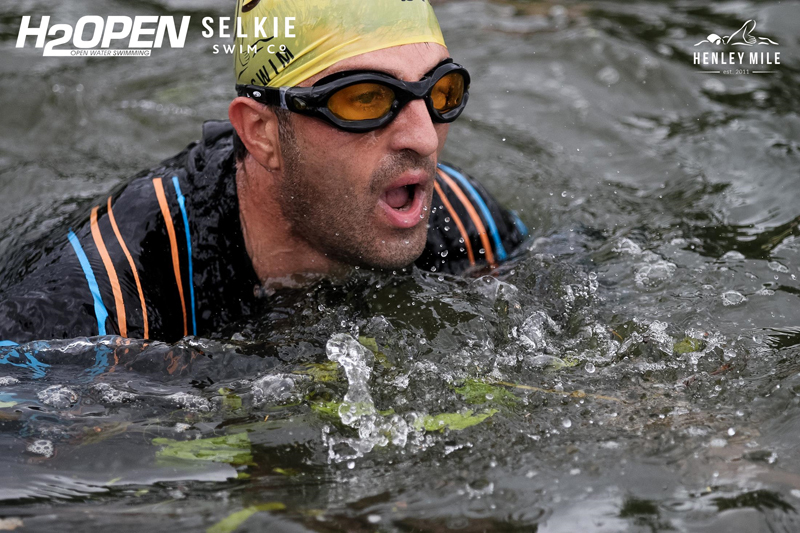 I should point out that the Henley Swim made the excellent photographs (above) available for free which was an excellent added bonus. So thanks to the Henley Swim team for getting a beginner through the event and well done to Paul and Katie, we had a good fun day out and I might even be back next year.